Exquisite custom home in a quiet pocket of South East Oakville. Elegant architectural detailing and the highest quality materials used throughout. Enter the foyer with 10’ ceilings and custom millwork including deep baseboards, 9’ paneled walls and double height crown molding. The front layout of the home appeals to tradition, with the foyer being flanked by the formal living and dining rooms. The living room, with oak hardwood flooring and a coffered ceiling, opens through double French doors to a private covered flagstone porch. The dining room features a tray ceiling with central chandelier, and convenient access to the servery and gourmet kitchen. A double coat closet, and powder room with bamboo finish stone vanity are conveniently located off the main hallway. The rear foyer with two-storey ceiling commences the open-concept portion of the home. The gourmet kitchen boasts custom full height soft close cabinetry, leather finish marble countertops and the highest end appliances, including Bosch and SubZero. An oversized central island with pendant lighting offers bar seating, or dine in the sunny breakfast area with charming built-in bench seating. The kitchen opens to a grand yet warm family room, with an impressive cathedral ceiling and gas fireplace inset the custom built-in entertainment centre. A den is quietly tucked away, with another gas fireplace, tray ceiling, custom built-in shelving with accent lighting, and a bay window overlooking to rear yard. A mudroom and laundry room with heated limestone tile flooring provides access to the finished double car garage. Upstairs, the second level landing is open to below, flooded by natural light from the oversized feature window. Double doors open to the airy master bedroom with vaulted ceiling and bay window overlooking the rear yard. This retreat boasts a walk-in closet with custom built-in storage and luxurious five-piece ensuite with his and hers vanities, Neptune Jacuzzi soaker tub, and a walk-in glass shower with body jets. Two additional bedrooms, sharing a five-piece Jack & Jill bathroom, and a fourth bedroom with private three-piece ensuite complete the second level of the home. The fully finished lower level, with heated floors throughout, provides ample space for relaxing and entertaining. The focal point of the recreation room is the gas fireplace with full height stone surround. The recreation room opens to a games room, next to the temperature controlled wine room. A powder room with floating wood vanity is opposite the exercise room, with double glass door entry. No custom home would be complete without a nanny suite, with walk-in closet and four-piece ensuite. The fully fenced rear yard could easily substitute for a cottage, with its outdoor living room with cathedral ceiling and wood burning stone fireplace with rustic wood mantle. Take a dip in the gunite inground pool, with double cabanas and delineated flagstone lounge areas. 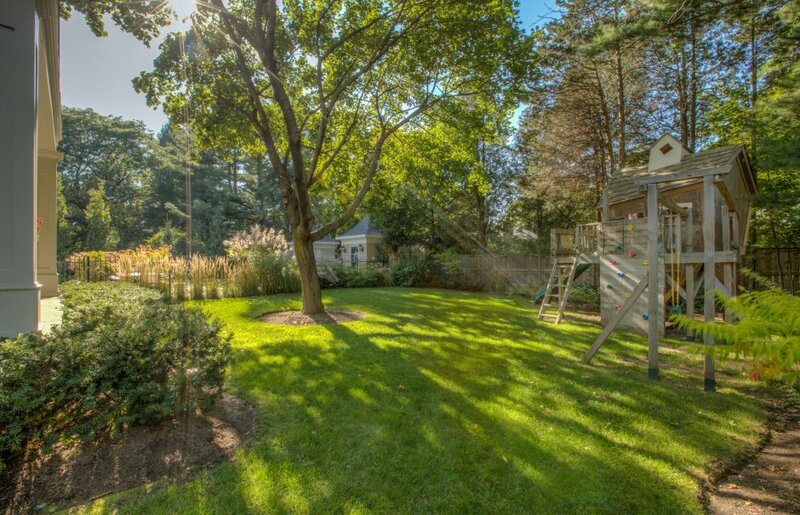 Mature, professionally landscaped garden beds bestow a lush, Hamptons feel. From maintenance-free aluminum windows and Landmark 35 year shingles, to built-in speakers throughout, no detail or desire has been overlooked in this meticulous yet livable family home.